While this broccoli salad's taste does not rival the more common version that features cheddar, mayo, and bacon, it is healthier. The next time that I make it, I think I will add more peppers, and leave out the broccoli. Chickpea and pepper salad with feta dressing would be perfect. We just aren't big fans of raw broccoli, unless it is disguised better. The rest of this was delicious, so if you do like raw broccoli, give this recipe a whirl. 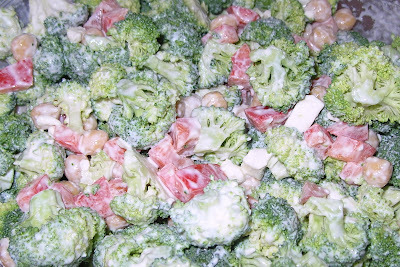 Broccoli Salad with Creamy Feta Dressing Ingredients Cont. Broccoli Salad with Creamy Feta DressingMix feta, yogurt, lemon juice, garlic and pepper in a medium bowl until combined. Add broccoli, chickpeas and bell pepper; toss to coat. Serve chilled. Shrimp has always been a favorite of mine. As a young girl, I always ordered either shrimp, or ham when we went out to dinner. When SH and I married, we served a giant bowl of chilled shrimp to our guests. I have a picture. I was taking food pix back in 1986, knowing I would one day need them for blogging. Too bad the album is in one of the many moving boxes, or you could feast your eyes on my trifle bowl filled with shrimp. A few days ago while grocery shopping, I couldn't resist the large shrimp as they called to me from the case. "Buy us, buy us. You will save two bucks on a pound. You know you want to." Once home, to a box of cooked couscous, I added two chopped tomatoes, a package of basil and tomato reduced fat feta, lemon juice, and olive oil. Then I remembered that I had used up the garlic powder prior to our move. Yes, I use powdered garlic. It tastes just fine to us. I pulled off the tails, because presentation is not everything to me. Powdered garlic, and messily chopped shrimp, what next? Oh, wait, there wasn't any garlic. I thought this was a tasty treat. BG ate it, but told me the next day that she prefers shrimp scampi. SH ate it, but said it "needed something". Well, it was still good, and even better for lunch the next day. Here is another couscous recipe, in case you want one with measurements. 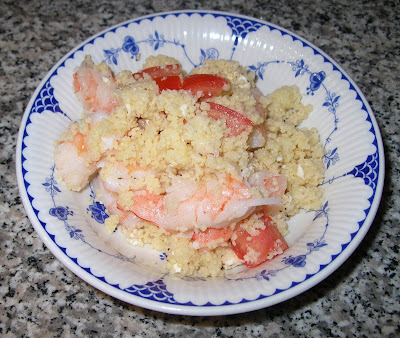 In the one above, I used a pound of jumbo shrimp, two tomatoes, a 10 oz box of couscous, the small plastic box of feta, and the olive oil and lemon juice were not measured. I believe that is called "to taste". To my taste, it was a success. Combine onion and 1/4 cup of the chicken stock in a large saucepan and cook over medium heat until the onion is soft and translucent. Add the remaining chicken stock, coriander, cumin and chickpeas and bring to a boil. Reduce heat to low and simmer, covered, for 5 minutes. Add the diced nectarines and couscous and mix well. Cover tightly and remove from the heat. Allow to stand for 5 minutes, or until all of the liquid has been absorbed. Garnish each serving with nectarine slices, if desired.